Another month has flown by, and with it comes another set of problem calendars. Enjoy, and let me know if you find any errors! 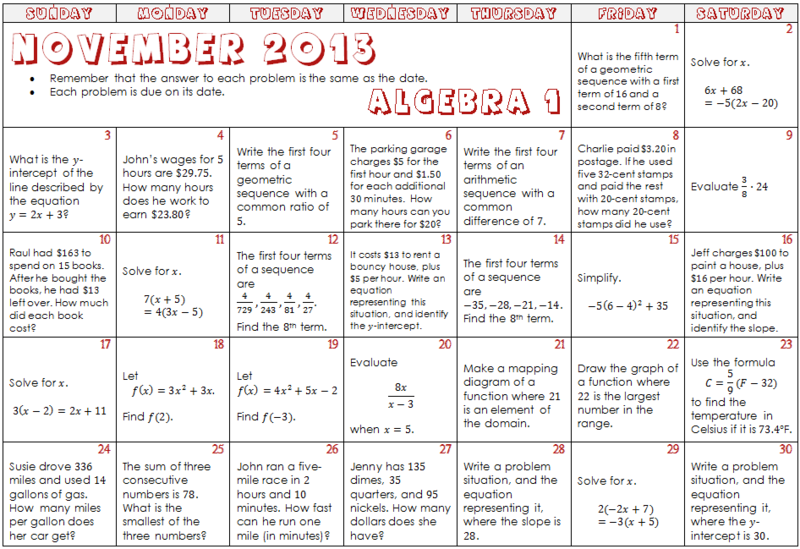 This month’s calendars borrow problems from Mrs. Reilly. Give our definition of congruence. Have every student write their favorite method up on the whiteboard. Ask students to respond to the various methods on the board. Lead a pretty good discussion. Settle on, and define, superposition as our method of choice for the time being. Have every student write their favorite move on the board. Ask students to respond to the various moves on the board. Lead another pretty good discussion. Students struggled to differentiate between the definition of congruence and the method by which figures could be shown to be congruent. Many students said we could show the two figures congruent by showing they had the same size and shape. This is true, but also just the definition. The Greeks’ obsession with compass and straightedge geometry stands very far afield from my own students’ relationship to geometry. Some form of “just measure it” was common to almost every student. My students understand that figures have properties, but struggle to identify which of those properties are sufficient conditions for determining other things. Last year, I kind of assumed that students came with both abilities. My students are more comfortable with translation and rotation than reflection. Most students are aware of all three concepts, if not the terms. Two of the three classes came up with superposition on their own. Cool. I’ve been stressing the idea of informal proof and making a case for why a thing is true (or false) this year. Today we went through each item on the board and formulated arguments for the truthiness of them. We came up with counterexamples for things they claimed were false (“draw two figures with the same area that aren’t the same shape”, “draw two figures with six squares that aren’t the same size or shape”). We made arguments to explain why certain pairs couldn’t exist (“why can’t we draw two congruent triangles, one with a right angle and one with no right angles?”). We talked about how it’s important to actually be clear in what you write, so people understand what you mean. The conversations were good. Not great, but good. I am a much better facilitator of discussion than I was when I first started all this. I still need to be better. But students were engaged and thinking, and, most important when compared to last year, students were developing their own counterexamples and arguments to develop mathematical understanding. Tomorrow we will practice our rigid transformations by using them to show that various pairs of figures are congruent and begin to think about how the coordinates change under each operation so we can develop algebraic rules. If the future, we will hopefully utilize these experiences to move toward more formal proofs. This year is going a lot slower than last year, but I think it is paying off in a big way, because my students are actually thinking and justifying their own thoughts. Have the gross zombie on the projector when students are walking in. Answer “You watch The Walking Dead! ?” affirmatively a bajillion times. Have students take out some paper to keep track of their work on. Demonstrate the concept of one zombie eating another zombie with fun role play. Explain that there are no zombie hunters for today’s simulation. Let students get to work answering the question on the board. Wait for someone to ask how many people live in Seattle. Go to slide two. Remember how great Seattle is. Let students continue working to answer how long until Seattle is completely zombiefied. Share results. Talk about how the growth rate is different from the linear models we’ve seen in the past. Switch to slide three. Take bets on how long it will take. Let students get to work. Share results. Talk about how everyone overestimated the time it would take because they didn’t really realize how quick “exponential growth” is. Show the graph on slide four. Talk about the two tails. Work through slide five, introducing notation. Work through the Zombiepocalypse: Day 2 handout during the following class period. The Day 2 handout might be a little too verbose for your needs. 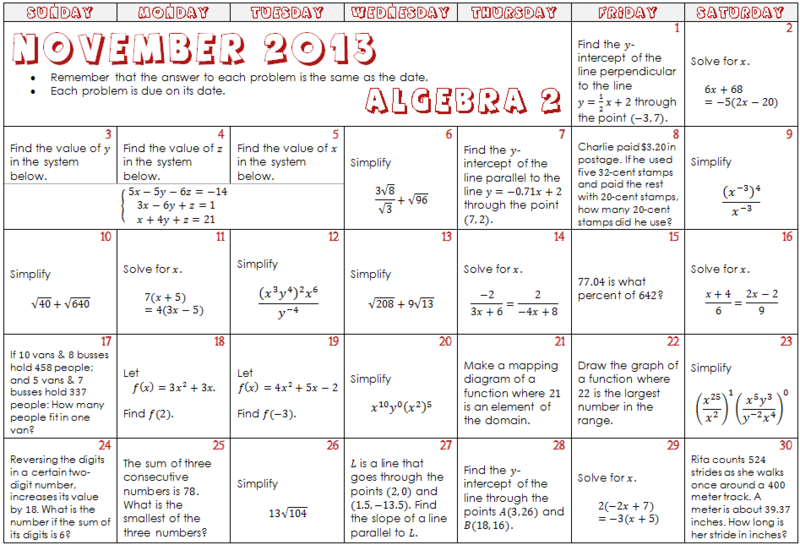 My algebra 1 students do well with lots of repetition and scaffolding. They were able to work through these two days well, and they also seemed to enjoy it. I got the idea for this from someone out there on the internet, but I have no idea who. So if this looks like what you did, let me know so I can give you some credit. Curricular Goodies: Walking Dead (ppt) | Zombiepocalypse: Day 2 (docx). They were run through the Pages and Keynote wringer, so hopefully the formatting isn’t too wonky. One of the Common Core standards for geometry is partitioning a directed line segment into a given ratio (G.GPE.6). This falls firmly within the category of Things I Never Learned in School. Cursory Googling led to a nice little formula, which Shmoop calls the “section formula”: . Formulas are nice, but my students don’t do so well with them. As a general rule, they aren’t willing to really commit to memorizing anything. By the end of the year, this results in a crazy mess of half-remembered formulas. I’m trying to avoid that this year, so I’m leaning more toward processes and thinking that are generalizable… even if this means students spend longer solving specific cases than they otherwise would have to. Thus, the proportions method of finding midpoint. 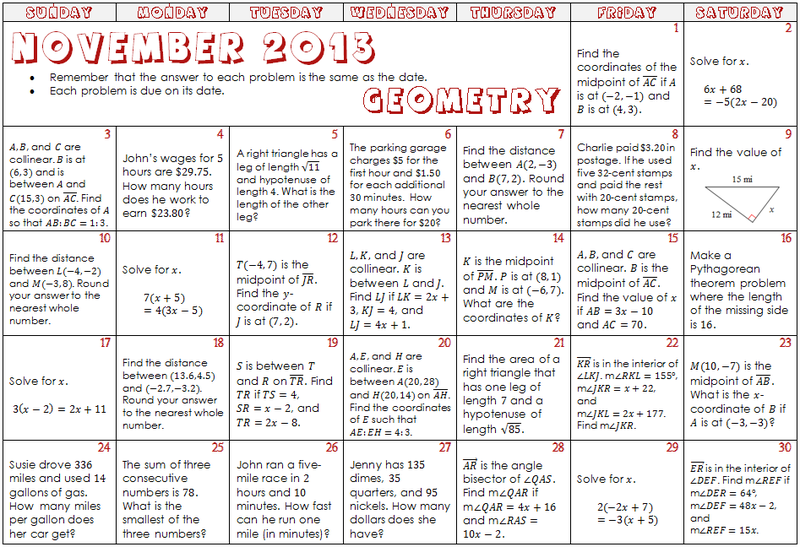 I really like this because last year my students had no idea what the midpoint formula meant… despite the fact that I felt like we drew it out pretty well. On the other hand, my students are really good at proportional reasoning. I also really like this method because it is generalizable: it doesn’t just work for finding the midpoint when given two endpoints, but it also works for finding one endpoint when given the midpoint and another endpoint, or for finding the point that partitions a line segment into a given ratio. It even works when given one end point, the point of division, and the ratio. In other words… it always works. One process to rule them all. Holla. First, draw a picture. The picture is very important, because when you’re doing these problems, you’re talking about directed line segments, so order matters. I always draw the lines as though they were perfectly horizontal, but you could draw them accurately if you liked. What’s important here is the order of the points. We use for the coordinates of , because we love algebra and when we don’t know something, we use a variable. Now you set up a fancy proportion to find the x-coordinate. We need to find distance from to considering only the x-coordinates. Hence, . Again, order is important: subtract the more-right coordinate from the more-left coordinate. Do the same for the distance from to and get . When all is done, you get the proportion . Solve for and you get the x-coordinate of is . Now do it again, but considering the y-coordinates. The proportion is . Solve for and get the y-coordinate of is . If you want to find the midpoint, use a 1:1 ratio. If you want to find an endpoint when you’re given one of the endpoints and the midpoint, just follow the exact same process, and it will all work out in the end. My students grasped this a lot quicker than they did the midpoint shenanigans last year. And they can solve problems they couldn’t have last year. Go team. Here’s the worksheet I used when I introduced the process. We walked through problem #1 together with me just helping to organize everyone’s thinking. Here’s a solution key that is hopefully legible.